Writing Ebner became focal point of Gartz family life. 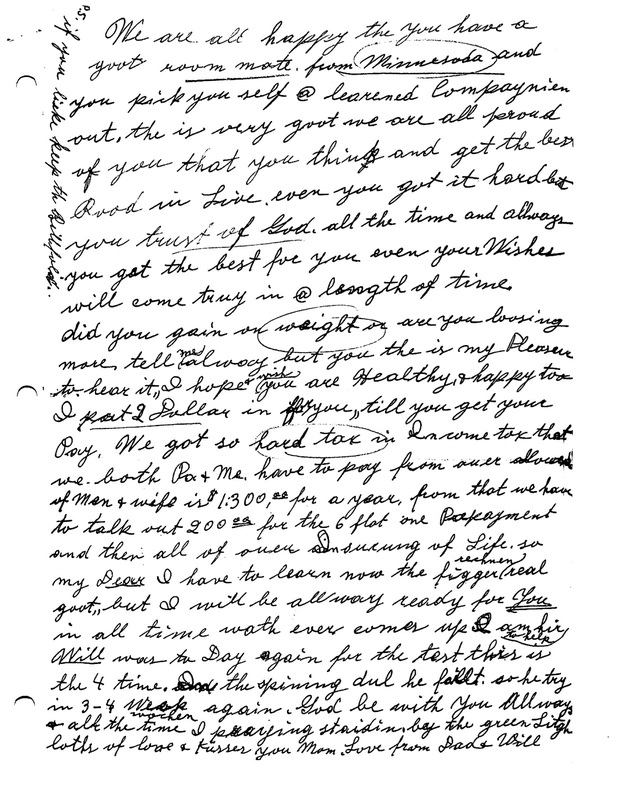 Here's a letter from the oldest Gartz brother, Will. Born in 1913, he was eleven years older than Ebner. 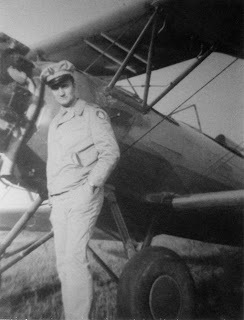 Age 29 when Ebner was drafted, Will was probably too old for the draft himself, but he did his part, by becoming a pilot in the Civil Air Patrol. The previous November, 1942, the month my parents married, Congress lowered the draft age to eighteen, just in time to require Ebner, who was born May 14, 1924, to enlist. As you'll see, Will was a serious fellow. The eldest, of three boys, he was the "good boy," always following the rules, and offering advice to his younger brothers. 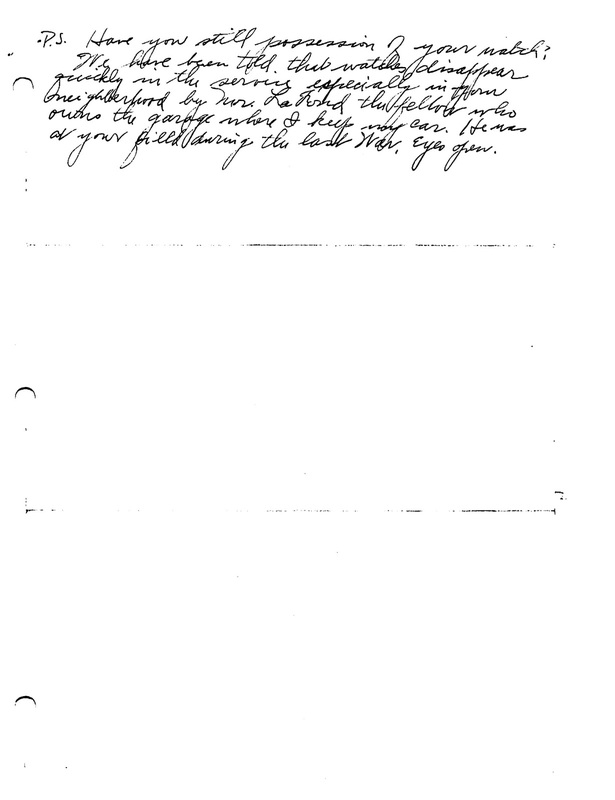 I've shortened the transcription of Will's 1/31/43 letter just a little, to eliminate uninteresting or confusing sentences, but you can read it in its entirely at the end. Note: The Von Arx family, mentioned in Will's letter, included another Frank, who was my uncle's best friend. They called each other's mothers "Mom." A letter from Frank Von Arx, also in the military, is coming up soon, a window into these young men's experiences and their adorable senses of humor. Just arrived home from the field after quite a day of weather changes that started with a fog which partly cleared, then closed in, then a rain with wind from the southeast which gradually changed to snow and wind from the northwest. The transformation was a typical “cold front” leaving all the streets covered with ice. Enough of this now and greetings old boy. How are you and how do the regulated hours agree with you? So you’re slated for radio work. Well, it’s a great field with unlimited opportunities, so apply yourself and go the limit. Just what phase are you in anyway? The Von Arx’s have been asking for you constantly and Mrs. Nielson has asked for your address so she can write you. Things sure are quiet around here and we all miss you. Until our next, hasta la vista. Have you still possession of your watch? We have been told that watches disappear quickly in the service, especially in your neighborhood....Eyes open. My grandmother's letters to her son were written in a foreign language––English. Lisi Gartz's schooling back in Austro-Hungary, before it became Romania after World War I, only went as far as the fourth grade, so even in her native tongue, spelling and grammar had never been mastered. 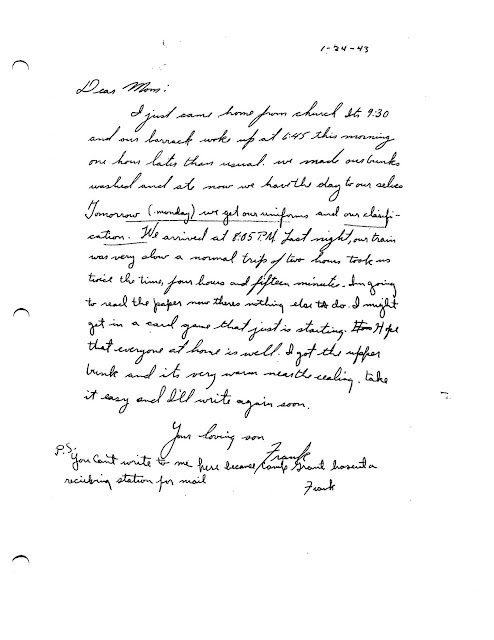 At the time her youngest son was drafted on January 23, 1943, she had been writing to her relatives back home for more than thirty years. Now, for the first time, she had to write in English. I know that she kept a German English dictionary by her side, struggling to put into words what was in her heart and mind. She became Ebner's most loyal correspondent. Her letters are written with a German accent, as she tries to work out the phonetic spelling of English words she knows, but probably never saw in print. I've corrected some of the spelling and grammar in this and all future transcriptions, only as much as needed to make the letter understandable, but I've left much of her syntax as written to be as true to the original as possible. Until I read her letters, I had no idea how much my grandmother's religion meant to her. In virtually every letter, she wrote of her prayers to God and her trust in Him to protect and guide her youngest son. 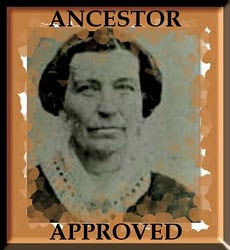 The family usually addressed the "baby" of the family by his middle name, Ebner (ABE-ner), my grandmother's maiden name. 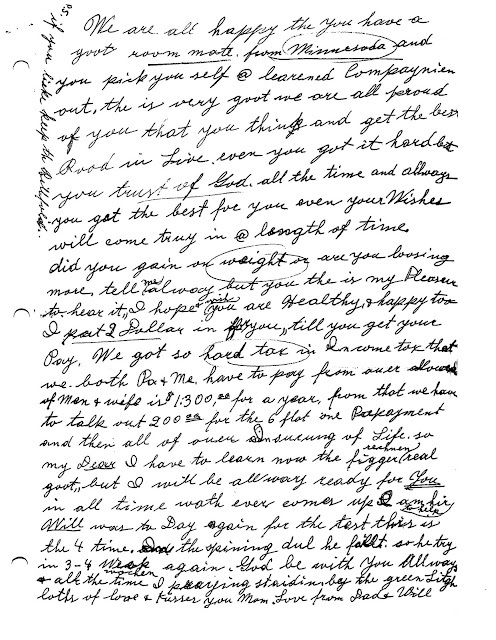 This is her first letter to Ebner, written a week after he left for training. 1) At the time of my uncle's military induction, my grandparents had been making their living for more than 20 years as janitors for several large apartment buildings on Chicago's West Side. They cared for up to sixty-five apartments. It was hard, non-stop, physical work: all repairs, window washing, cleaning vestibules, shoveling coal and snow in the winter, repeatedly climbing multiple flights of stairs to take down the trash. That's just a tiny sampling. They had lived frugally, saving $200/month of their $250 income, and supporting the whole family of five on the remaining $50. Their savings allowed them to buy at least one six-flat, by this time, mentioned in the letter. 2) The "green light" she mentions in this letter were two small table lamps with green, beaded shades, flanking Ebner's high school picture. My grandmother's original letter appears below this shortened transcription. You had to wait five days befor I anserte your letter, but you know how it is in our work some days––running the whole day up and down especially in morning time. The 27 Sep I sent you sweatshirt and some banana. Have you received everyting? Please tell me next time. We are all happy that you have a goot room mate from Minnesota you picked yourself. That is very goot. We are all proud of you that you get the best road in life. Even [if] you got it hard, trust in God all the time and always you [will] get the best for you. Even your wishes will come true in time. Did you gain or lose weight? I hope you are healthy and happy too. I put 2 dollars in for you till you get your pay. We got [hit] so hard with the income tax. Both Pa and me have to pay from our allowance of man and wife $1300.00 for a year. From that we have to take out $200.00 for the 6 flat one payment and then all of our life insurance. So, my Dear, I have to learn now how to do the figuring real goot. But I will be always ready for you at all times, whatever comes up. I am here to help. God be with you always. All the time I am praying, standing by the green light. A WWII Draftee's First Day. 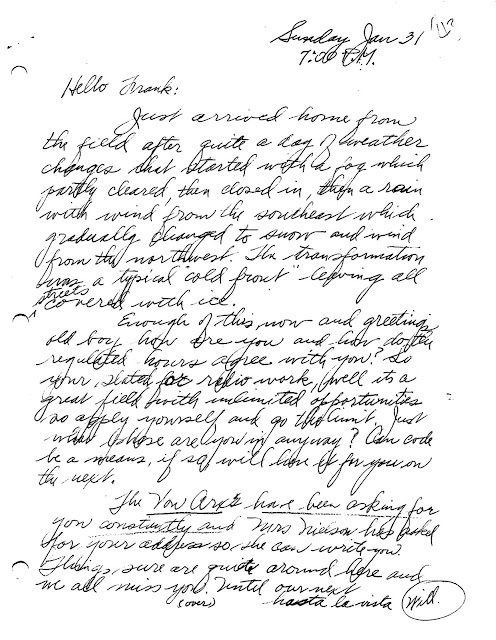 The next day he wrote from his new home at Camp Grant, near Rockford, Illinois. Until I found the letter below, I hadn't know where he had started his training. Here's how the first day in training was reported by a new inductee on his first day in camp. Note: I corrected spelling and added punctuation to make reading easier. 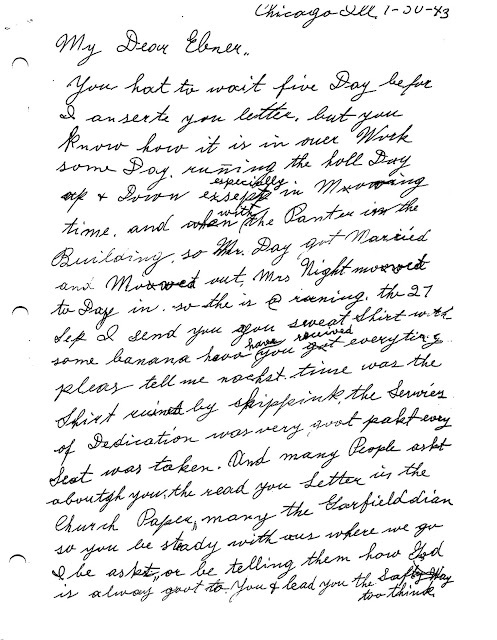 Original below transcription. I just came home from church. It's 9:30 and our barrack woke up at 6:45 this morning, one hour later than usual. We made our bunk, washed, and ate. now we have the day to our selves. Tomorrow (Monday) we get our uniforms and our classification. We arrived at 8:05 P.M. last night. OUr train was very slow. A normal trip of two hours took us twice the time, four hours and fifteen minutes. I'm going to read the paper now. There's nothing else to do. I might get in a card game that is just starting. Hope everyone at home is well. I got the upper bunk and it's very warm near the ceiling. Take it easy and I'll write again soon. P.S. You can't write me here because Camp Grant hasn't a receiving station for mail. Seventy years ago today, my grandparents and newly married parents faced a foreboding task, one that was shared by just about everyone in America with a young man of draft age in the family. On January 23, 1943, they climbed into Dad's Model A Ford and drove the five blocks from their home down Chicago's Washington Boulevard to the draft office, where my Dad's ten-year younger brother, Frank Ebner Gartz, would officially report to begin the training to become a navigator for the Army Air Corps in World War II. The photo to the right is the first "Gartz Family Photo" that includes my mother. 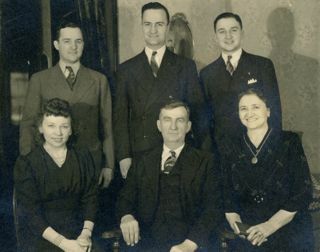 Taken just two months after my parents married, and one week before Ebner was drafted, my guess is that my grandmother wanted a family picture with the "new Mrs. Gartz" as part of the family before her youngest son left for training. I know the dates of both photos because each was labeled, but the car photo had more than a date. Coming upon it, I saw only an unremarkable old car parked on a snowy street, with no identifiable people. But it was on the back where I learned the critical event this photo documented. Prior to finding the photo of the car, Blitzbuggy had only existed in family lore. My father had probably told us what vintage the dear little car was, but it hadn’t stuck in my memory. Dad’s notes not only identified the car--its year, model, and make--but also recorded the contribution Blitzbuggy had made to one of the pivotal events of the 20th Century -- and our family’s connection to it. Frank Ebner, (ABE-ner) Gartz, born May 14, 1924, was my grandparents’ youngest son. His middle name was taken from my grandmother, Lisi’s, maiden name, one you’ve read in numerous past posts. The photo reveals a familiar Chicago winter scene: the snow is piled on the sidewalks, and greystone apartment buildings, typical of the city, form a backdrop. The entire atmosphere of the photo--its blurry focus, the gloomy, colorless weather, the faces of the two women in the photo hidden or indiscernible, the lone black auto on a strangely empty street--create a visual metaphor for the emotions of a family about to send its youngest off to war. This date also started a flurry of letters back and forth between Ebner, as everyone in the family called Frank, and his family and friends. I hope to post excerpts of several of the letters, on or close to the day they were written. So keep tuned. Note: parts of this post were published in February, 2011.